Painted, decaled, weathered and brake parts in the right locations! I'm very pleased with how this car has turned out. Aaron has done a superb job on this pattern. Thanks buddy! We are also going to be offering a supplemental decal sheet to back date the lettering to pre-war styles. Ask us about it when ordering or see me in Naperville. Not for sale just yet. Sorry. I'd instinctively know where brake parts go. Having built over 1000 resin kits to date, placement of components should be second nature. But apparently not. So there I was feeling pleased as punch with myself. All the etched parts are fitting just as I'd hoped. The A frames for the brake levers are working out exactly as designed. Everything's looking delightful. All the photos for the instructions have been taken and the car is ready for paint. As I'm starting to spray color onto the car I get this odd feeling that something's not right. Palm to forehead moment. I've put the brake parts on the wrong side of the car. Dooh! Fortunately it's an easy fix. I finished painting the car, tomorrow I'll move the brake parts to where they belong. Take new pictures and move forward some more. To have these 2 new items ready for the RPM Naperville next month. 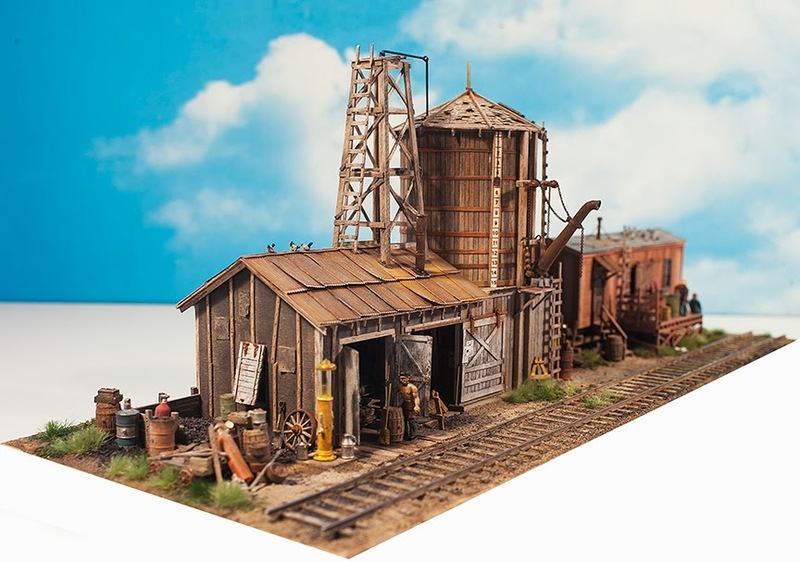 First up is this AC&F covered hopper roof mini-kit. This set of castings and etchings is meant to refit an InterMountain Railway Co covered hopper kit to better represent cars used by MP and other roads. And then there's this bad boy. 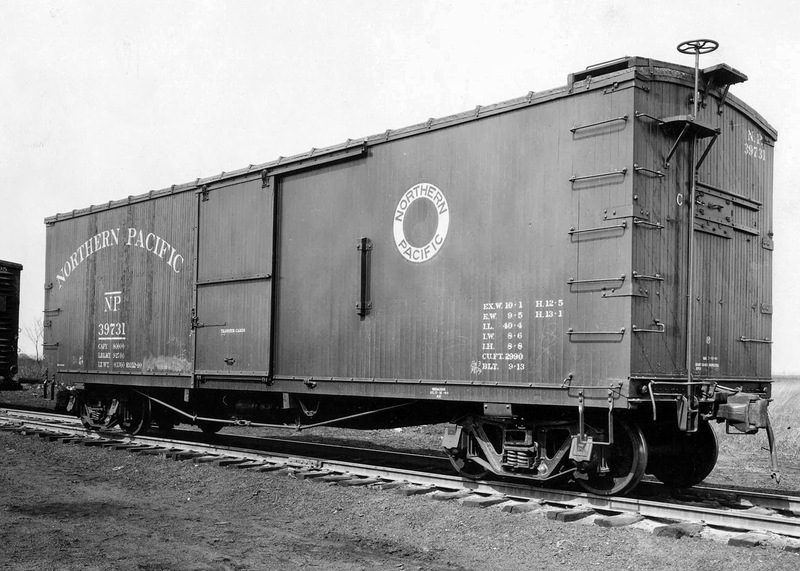 The NP 39000 series boxcar. We've been working on this for awhile. The etchings are now in hand, so work can now continue on the pilot model. This car features a rather different brake rigging arrangement which we've worked hard at to recreate. As you can see there are 3 levers, 2 of which are mounted on etched A frames. Alright, enough typing back to work. People will want these models. Has it really been 48 years? Wow! George Selios of Fine Scale Miniatures fame has just announced that he is retiring form the kit producing business. The kit shown in the above photo will be his last offering. Such a debt the hobby owes George. His was a rare talent. Just study the photos of his layout, the Franklin and South Manchester and you will get to see the depth of his skills. I built a few of his kits over the years. The first was in the mid 70s and it was the reissue of his homage to John Allen. The 2 stall engine house. The finished model is long gone, too many moves as a young man, but the castings are still in my drawers of treasures. Those kits were a delight. Well designed and the instructions took one step by step through the construction and finishing processes. I learned a whole lot of tricks from those kits. I didn't always agree with his heavily weathered approach to structures, too many appear to be on the verge of collapse, but I learned valuable weathering and distressing techniques and as a result evolved my own style and philosophy. Thanks, George. It wouldn't have been as much fun without you. Trevor's comment about being surprised at the number of Fowler boxcars in use got me thinking. Below is a chart created by Ian Wilson, well known author and CNR historian, showing suggestions on how to recreate an accurate fleet of CNR boxcars in HO scale. It is rather dated, being over 10 years old, but the percentages are instructive. Of course these percentages will undergo major revisions as we get into the 50's. By the end of the decade most of the wood sheathed cars will be gone. But for 1951, the era I model, the ratios are close to being accurate. I also have a secret stash of Red Caboose and Branchline kits. (Everybody remember kits?) So I'm set. As of this morning, my friend and fellow kit maker, Ted Cullota, has relaunched the Speedwitch Media website. Have a look, he's trying something different to support his activities, and I think it shows great promise. Ted's kits reset the bar as to what a resin kit should be, and in many ways his work was the inspiration for the kits I offer through Yarmouth Model Works. Good luck my friend! I hope it works out the way you wish. This little gem came into my possession recently and I managed to get it painted and ready for service in between other projects. 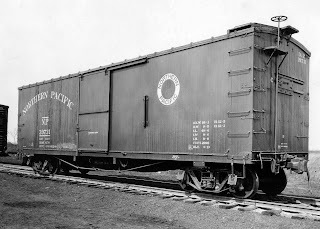 It's actually a MoPac prototype caboose offered by Overland Models, and the box label indicates that it can be used for T&P and the Wabash. It bears a striking similarity to the 2600 series cabooses owned by the Wabash. Close enough for me, given that there were so many variations in the 2600 series fleet. I know what details are "wrong". How about you? The relationship between CNR and the Wabash was clearly one of longstanding cooperation and goodwill. Take the case of CNR manifest freight #402. Scheduled as an eastbound between Windsor and Fort Erie, and returning west as an extra. It's job was to drop and collect cuts of cars in places like Glencoe, St Thomas and the interchanges at Tillsonberg and Canfield. During WWII, CNR was somewhat overwhelmed by the major increases in traffic created by the war effort. So much so that the CNR asked the Wabash to assume the duties of hauling #402 across the province. Remember that Canada was at war with Nazi Germany for more than 2 years before the US entered the conflict. This arrangement stayed in place after the war ended and as a result needs to be reflected in my train consists. So I will require 2 trains, one for each direction, that have a preponderance of CNR equipment, unlike the Wabash trains that have crossed the border from the US. This works for me on many levels. I get to build more of some of my favorite cars. The Speedwitch Media and Westerfield 36' Fowler boxcars, also referred to as the "Dominion" car. Even into 1951, my modeling year, there were large numbers of these cars in service. According to some data I have from well known CNR historian, Ian Wilson, 1/4 to a 1/3rd of the boxcar fleet was the Fowler boxcar. I just completed 4 of the Speedwitch offering. A kit that I reviewed for RMC when it first came out and remains a standout in my mind. The other project that I'll have to do more of is the conversion of the '37 AAR boxcar to Canadian standards. 8 rung ladders with integral stirrups, specific ends like the NSC-1 and NSC-2 and a few other details. These were written about many years ago in Railroad Model Craftsman by Stafford Swain and remain some of my favorite modeling projects. I could use the TrueLine trains cars, but I don't find that they have the level of detail I'm after. Good thing I kept a few Red Caboose kits when I switched prototypes.